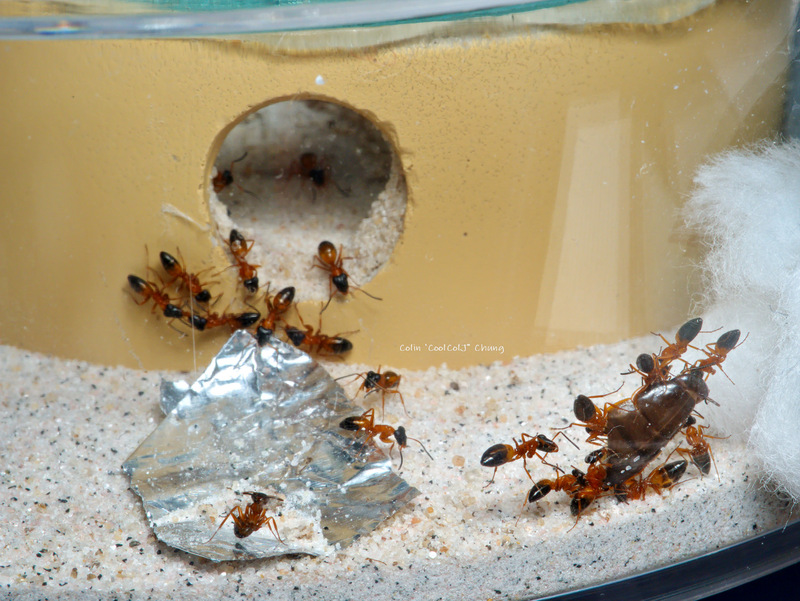 Iridomyrmex pupureus colony1 has been sold! Edited by CoolColJ, February 11 2019 - 1:59 AM. 2 cocoons spun over night. Took them out of the incubator and setup them outside on the heat cable. Test tube is super black moldy compared to the one below! Wow another worker eclosed already. Will sell these girls when a few more workers eclose. Edited by CoolColJ, February 11 2019 - 2:48 AM. From what I can tell my strobe ants like roaches way more than crickets. Two small roaches last week they dragged into the nest. She has 2 pupa now. I'm guessing they will eclose by the end of the week. Dual queen Setup 1 doesn't have too many workers yet, but damn their brood pile is huge, lots of larvae, so when they all eclose the numbers should crack 100! Edited by CoolColJ, February 12 2019 - 3:39 PM. Beautiful, largest Pheidole species in my backyard... 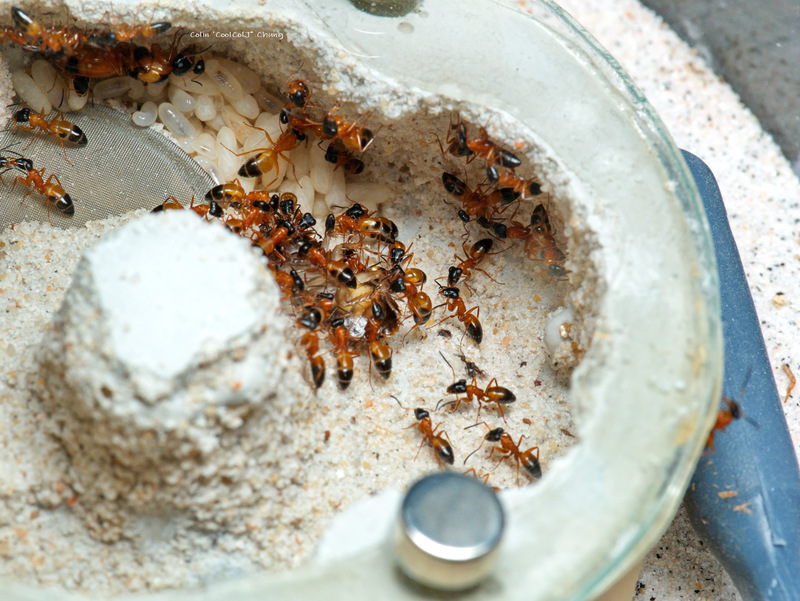 I hope I can get some alates of these in a 1-2 months time....! Edited by CoolColJ, February 12 2019 - 6:36 PM. 5 workers - 1 cocoon, large larvae, brood? They are just about impossible to find queens of as they do not fly, so no wing scars, no thicker throax than workers and obviously no flights. I have seen workers around here of 2 species, but never able to locate their nest. Okay, it would be really interesting to document such a rare colony. But it is rare, so hard to acquire queen. Plus they make repletes, well some that I know, so I guess they would qualify as honeypots. ARghhh unbelievable they opened their only cocoon too early again! When they open their cocoons too early, do the pupae "melt" into an opaque white paste? I had opened a cocoon of Camponotus ca02 early to see if it was actually a large major (it was) and it eventually "melted." This one looks like a normal white pupa. Edited by CoolColJ, February 13 2019 - 10:46 PM. 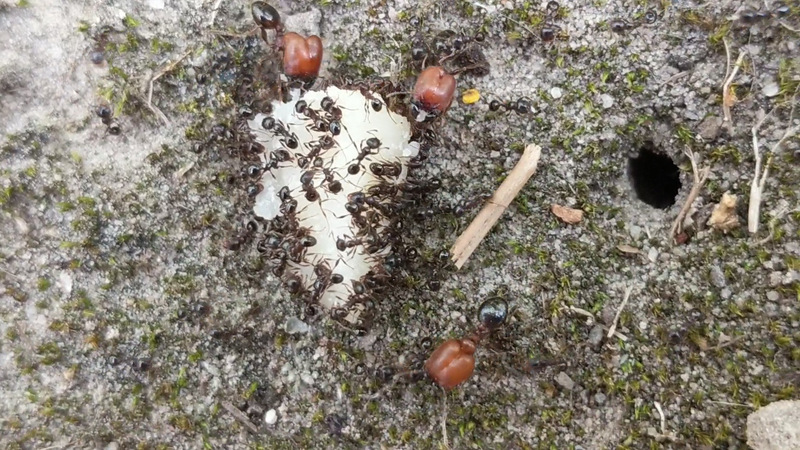 Feed the pupa to other ants. 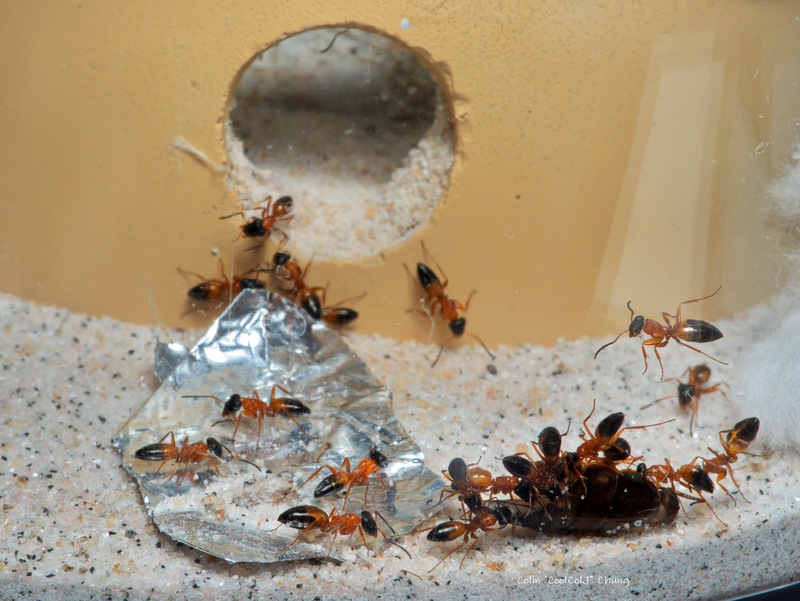 It makes good ant food. Counted at least 20 cocoons and 7 large larvae, not sure on eggs. Looks like there is a good chance they will get to 100 workers before winter! 5 workers - 1 cocoon, brood? 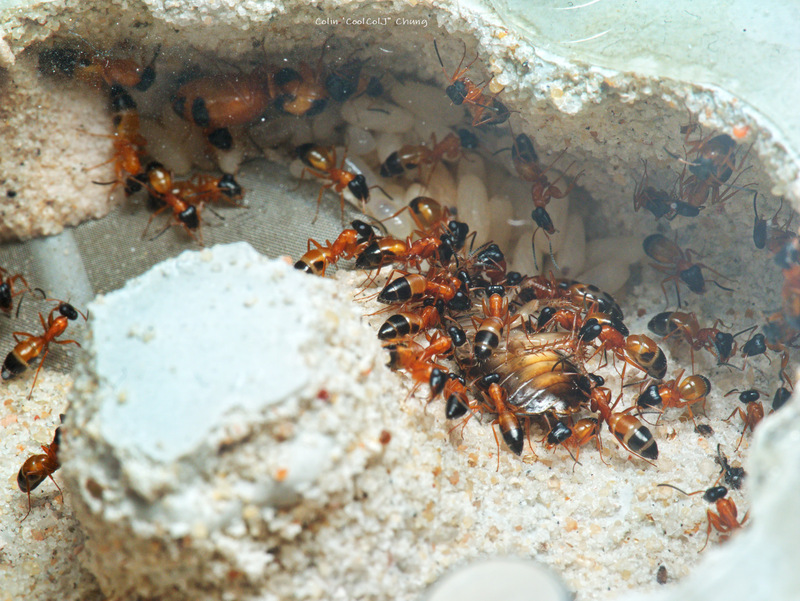 They have the remains of two small roaches with them on the brood pile. Only remains of half the baby roach are left, so the queen munched on it. These 2 are the largest and prettiest of the lot, so I have high hopes for them! Been thinking about how to move them out without the mite things following them out. Probbaly easier when they didn't have any workers, as I could have just pulled the cardboard out with them and the eggs ontop, and feathweight forcep them across into a new test tube. 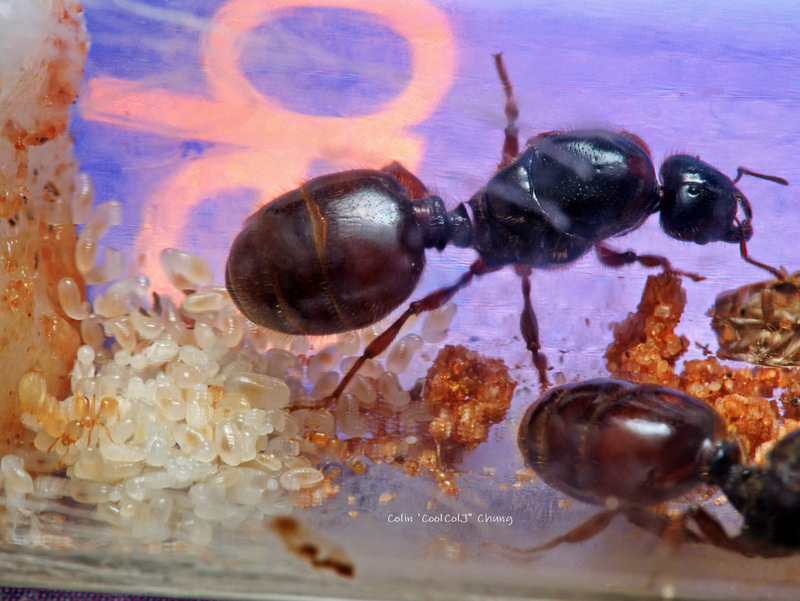 Queen 4 is also a larger and pretty queen with the dark orange bands on her gaster. 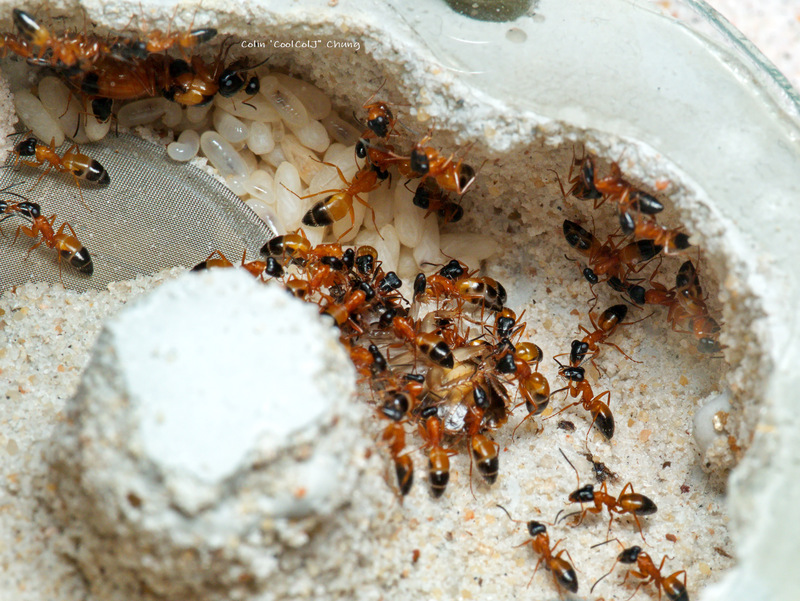 Still can't tell if her own eggs are developing yet, but she has a decent amount of workers now from donated brood. She has some pupa, but they could be from the donated ones, so until I see a lot of larvae I won't know for sure. 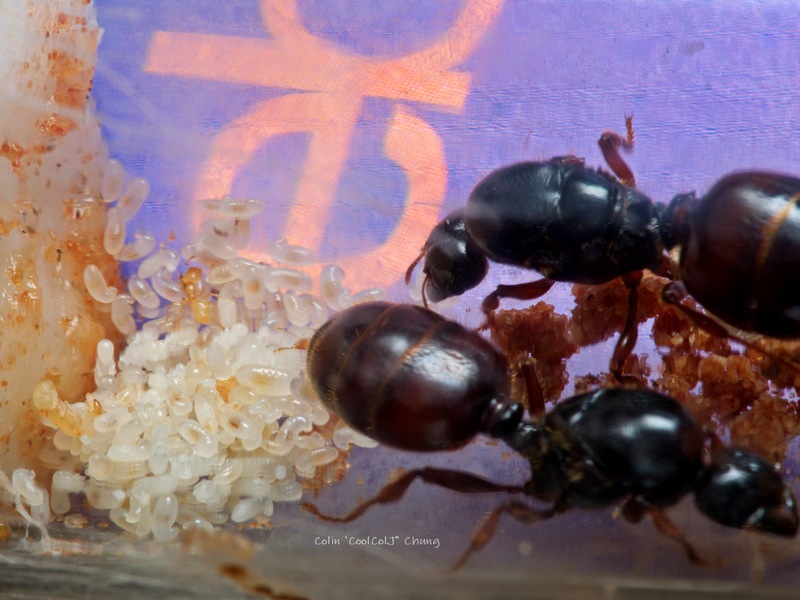 Queen 7 has another 2 more nanitics, for 4 total. Her own brood is coming along now. Might be selling this in a weeks time. Setup 1 still not getting much workers, but their masisve pile of brood has some light yellow pupa, so things should change this week. Queen 5 going well, but I'll eventually be selling her. Edited by CoolColJ, February 17 2019 - 5:41 PM. Pupa have dark eyes, but still white, 1 week so far and not eclosed yet.